new technology, coding and virtual reality. 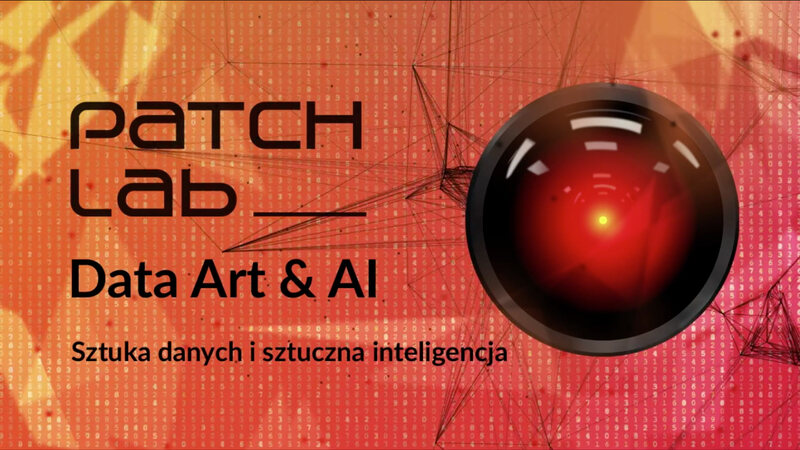 Between 24th and 29th October, for the 6th time Patchlab will raise the subjects relevant in the fast-changing world. The topics are sometimes uncomfortable, but always remain relevant from the point of view of a modern man, living in the digital age. This year’s main theme is data art and artificial intelligence. There will be projects presented that are created with usage of extraordinary material – big data bases, which have an increasing impact on our life and the whole society. Together with the growth of data amount and its role, there are now new possibilities of artificial intelligence development – total new level of being, which brings a lot of hope, but also anxiety. – explains Elwira Wojtunik, Artistic Director of Patchlab Digital Art Festival. The works displayed at this year’s edition will be exhibited in Małopolska Garden of Arts and at the Contemporary Art Gallery Bunkier Sztuki. The festival will comprise 14 installations, 6 performances, 3 workshops, meetings and presentations with electronic media artists from Poland, Germany, Austria, Hungary, France, Turkey, Greece, Cyprus, Italy, Belgium, Denmark, Portugal, Iran, Hong Kong, Japan and Taiwan. – The official opening of the festival will take place on 24th October, but we invite everyone to visit Czeczotki Palace on 23th October, where, together with Conrad Festival and Hungarian Institute of Culture, we will open a light installation ‘Dark Matter’ inspired by atmosphere of Heart of Darkness – reveals Elwira Wojtunik. The works displayed during the festival include a unique installation ‘Reading Plan’ by Lien-Cheng Wang, showcased at this year’s Ars Electronica, which brings up the topic of authorities controlling content read by students at schools in Taiwan. One of the most important events – presentation of ‘RadianceScape’ by XCEED from Hong Kong, an installation for electromagnetic field, projection and laser visualising radiation data from Fukushima and Chernobyl. There will be opportunity to meet artificial intelligence, which is able to write a book and to learn how to interrogate (Pretext and Triolog by Jerry Galle); to listen to the sound of stars and constellations (Stellar, Francesco Fabris); to track own activity on Facebook and see real profiles created by algorithms (Data Selfie, Hang Do Thi Duc); to see a reflection in a digital mirror, which projects one’s emotions right here and right now (Emotional Mirror, random quark), or to check what are predicted paths of development of art as seen by artificial intelligence (Art Predictive Art Bot, Nicolas Maigret and Maria Roszkowska). This year, one of the creator of the special project, which has always been a unique part of the festival, is Michał Jacaszek – renowned Polish sound artist, producer and author of experimental electro-acoustic and movie soundtracks . This project will be prepared together with Turkish visual art studio NOHlab, awarded at numerous audiovisual art festivals. Patchlab also will host this year multiple live acts and audiovisual performances. Lien-Cheng Wang from Taiwan and Boris Chimp 504 from Portugal will perform during the opening of the exhibition and on Friday night XCEED from Hong Kong will present live performance of their project criticising catastrophe in Fukushima Nuclear Power Plant No.1 and Microseq will present project shown at this year’s TodaysArt Festival in Amsterdam. A night with Anthony Rother at Szpitalna 1 will be the culmination act of the festival. This composer doesn’t need long introduction, he’s a living legend, the most influential continuator of Kraftwerk group. – His famous live acts attract huge crowds of fans. Rother will present ADJ set (Artistic DJ set), a unique performance based only on his own productions, not released to wide audience. – I’m sure that it will be an unforgettable night for Kraków’s club scene – emphasises the Festival’s Artistic Director. There will also meetings and workshops in the program of the Patchlab festival – „(NOT)safe data online. How do we lose control on our digital footprints”, “Play with PureData – workshops on music programming and interaction for Youth” and a meeting with members of Technopolitics group from Vienna, who work on innovative projects across the fields of art, research, science and education and will share their experiences of working on visualisation of a huge amount of data for the special project “The Timeline – Tracing Information Society”, which will be a part of the exhibition.